chase images and log by William T. Hark, M.D. 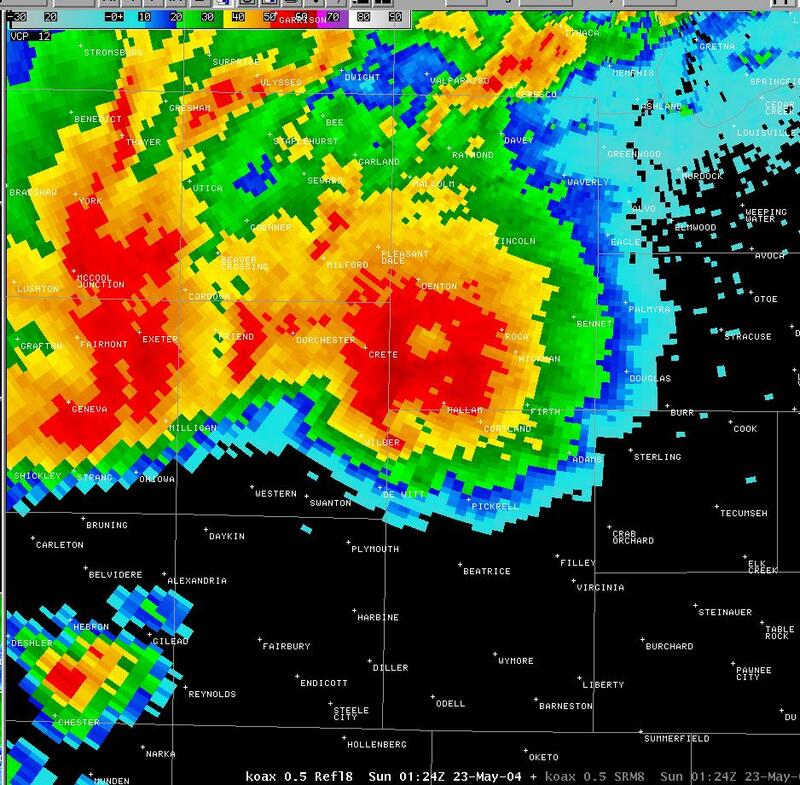 We blasted south on 77 to intercept a large supercell moving through the area south and southwest of Lincoln, Nebraska. The storm was splitting and we targeted the right mover. 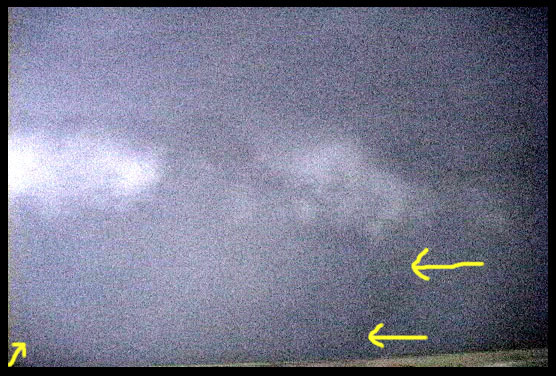 As we approached the storm, frequent CG's (7V) flashed in the distance. 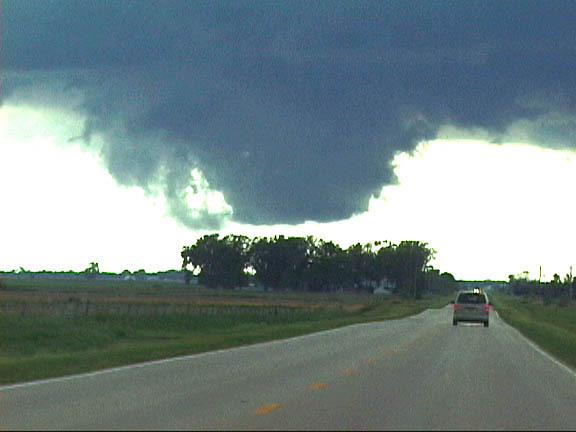 We turned west on State Road 41 and drove toward Wilber, Nebraska. 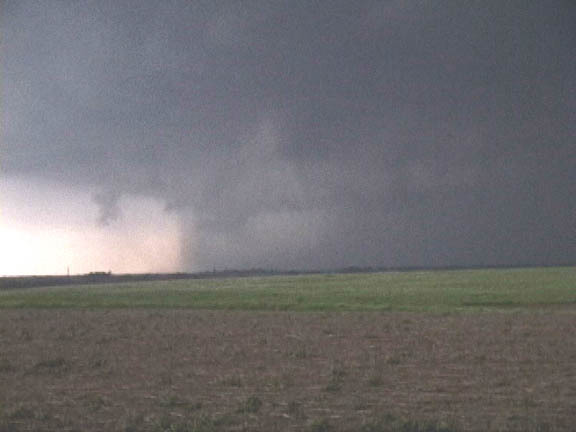 At 7:50PM, about two miles east of Wilber, Jeff thought he saw a wedge tornado to the right of the rain core. I couldn't see anything. We drove through Wilber and turned south on 103 at 7:54PM. 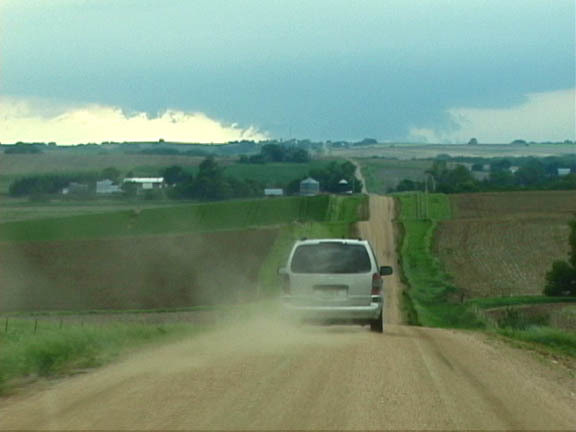 We parked a couple of miles south of town and watched the approaching storm (8V) to the west. 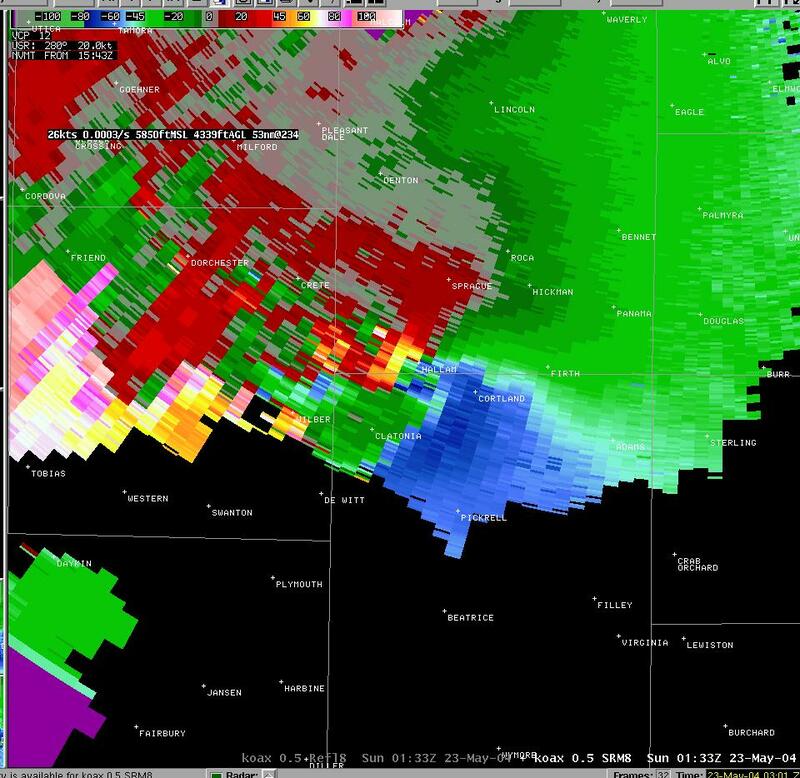 Very hot inflow blasted into the storm. 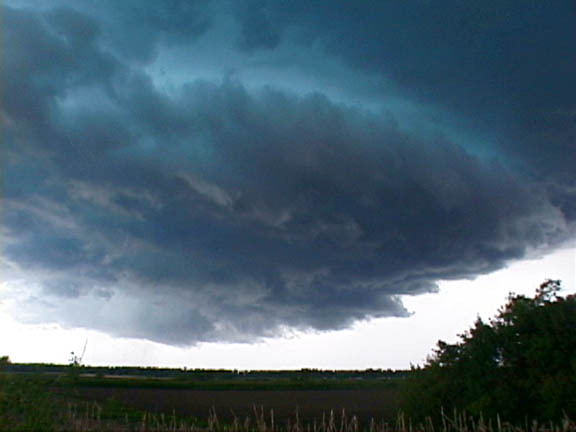 The storm was like a giant rotating cylinder towering into the sky. 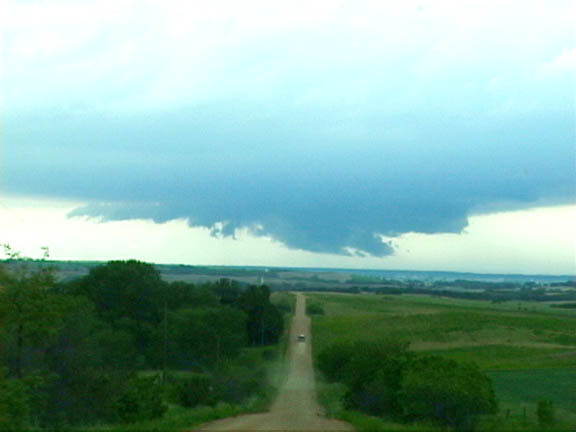 Inflow bands curved in from the south and the area under the storm was black (9V) . There was a tornado in the middle but it wasn't clearly visible. 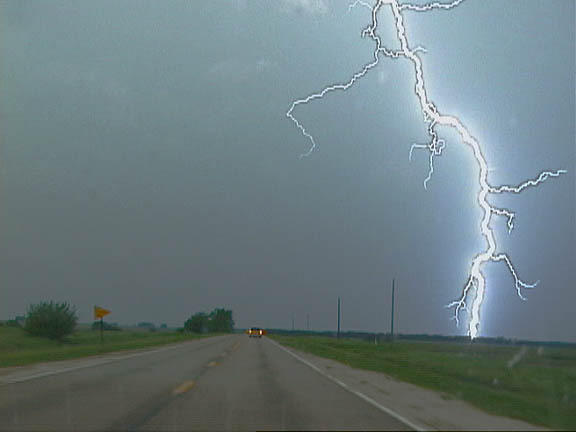 Lightning flashed under the storm clouds. (10V). Jeff stated at 8:05PM, "Something really bad is going to happen with this storm." 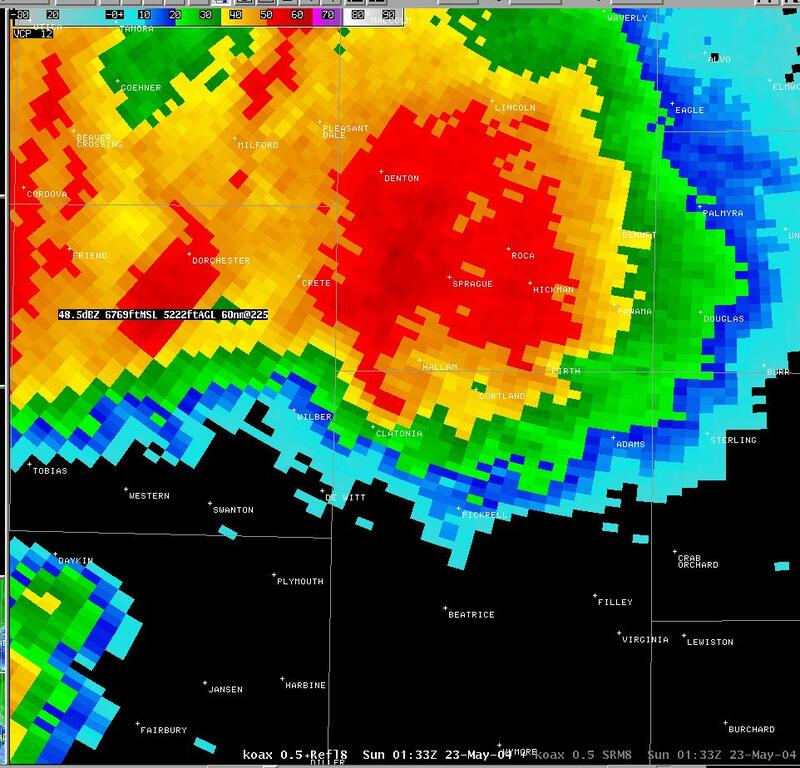 We dropped further south on 103, drove through the town of DeWitt (11V) at 8:13PM and headed east to follow the storm. We turned north on ?77 and again stopped at 8:32PM. 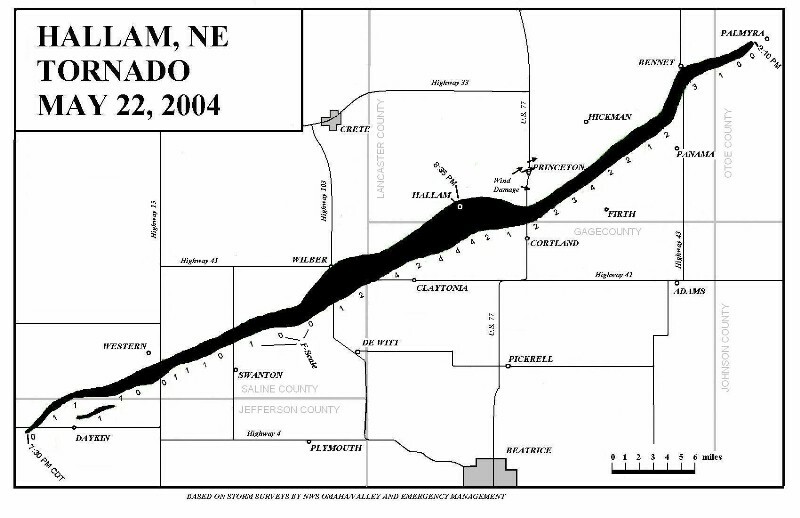 The storm (12V) was to the north and west (the direction of Hallam, Nebraska). The rapid rotation of the entire storm was amazing. I have never experienced such incredible inflow. 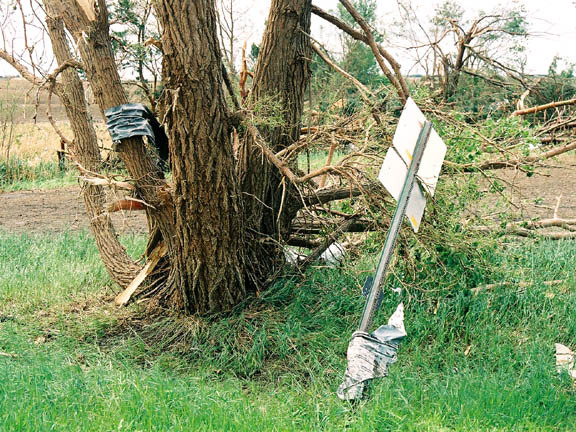 The car was shaking as it was blasted with wind. I was also worried as this monster was approaching populated areas. 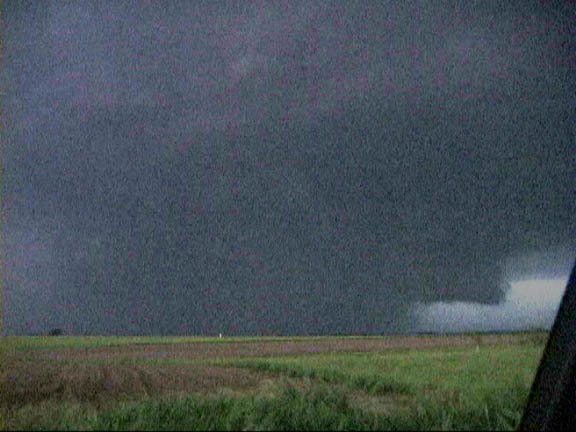 At times, I could barely see the edge of a monstrous wedge tornado (13V) through the darkness and rain. We drove north at 8:42PM but couldn't safely make our east option. 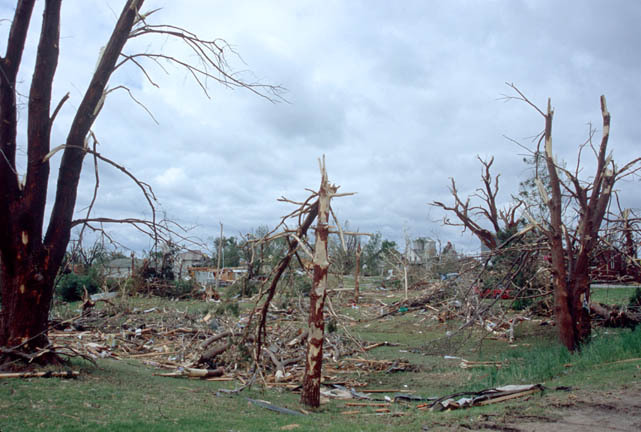 I encountered increasing rain and wind along with some flying debris. I turned back. Jeff, who was ahead of me, continued though I later found out that he also had to turn around. I drove to Beatrice and stopped for a quick bite to eat. I don't like to chase after dark. 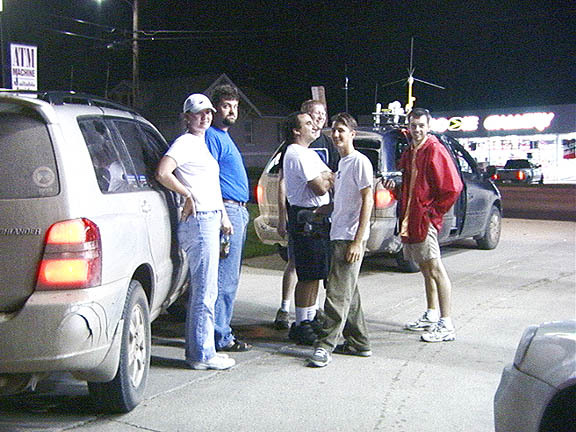 At 9:53PM, I ran into the Twister Sisters and the Weathervine Chase (14V) team and we compared experiences. I was worried as I observed groups of ambulances and police cars heading north. Something bad had indeed happened. 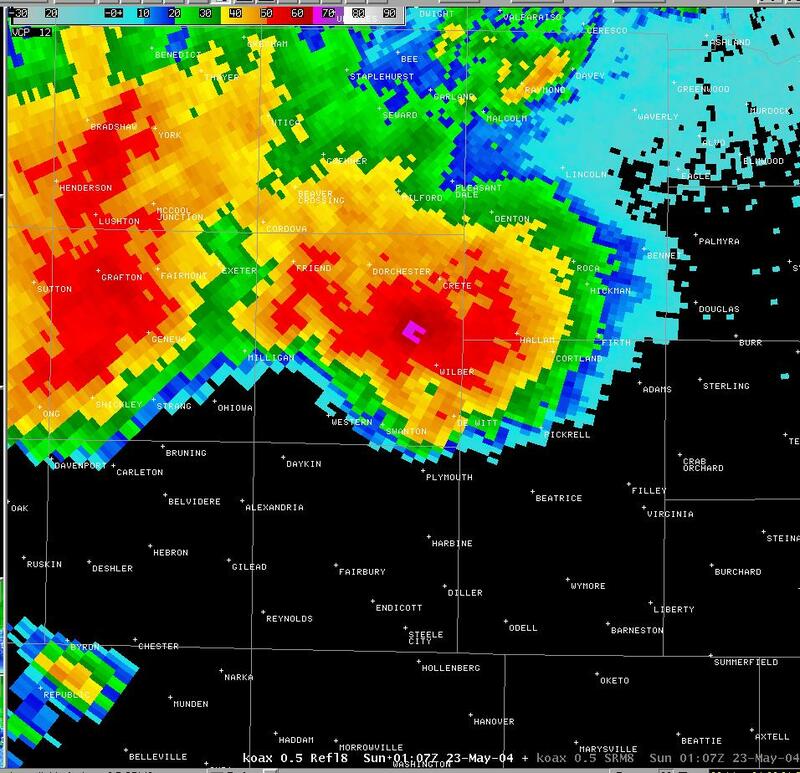 While talking with the Weathervine group, Jeff called and warned of an approaching meso from the west. The meso was confirmed by the Weathervine folks who had a WxWorx Mobile Threat Net. I dropped south and watched the almost constant lightning. 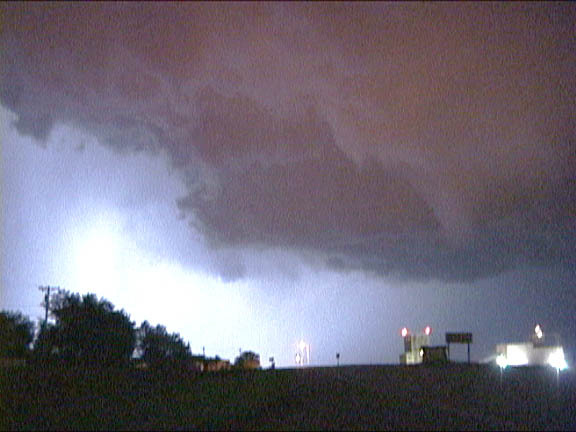 When the meso had dissipated, I headed north to check into the Super 8 Hotel in Beatrice. 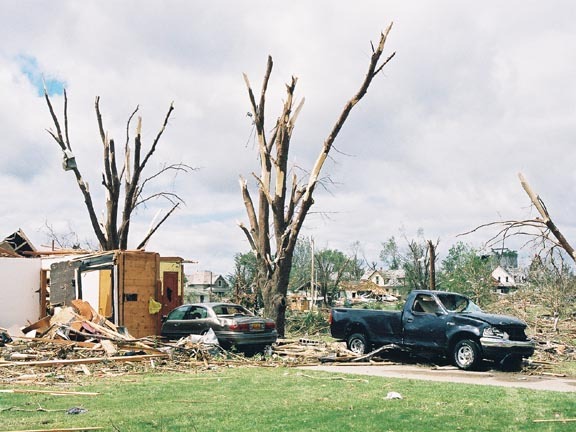 As I was getting out of the car, the town's tornado siren sounded. Tornado warning for Beatrice! 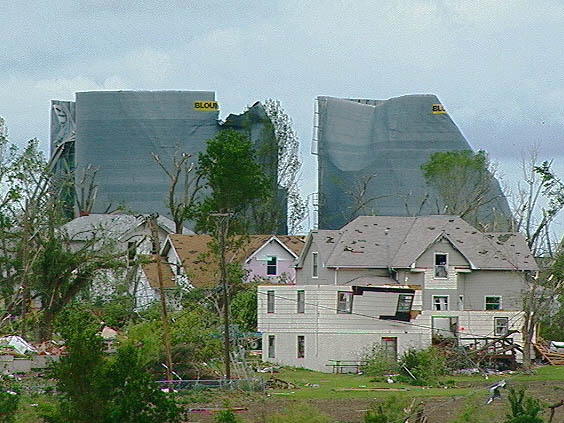 The area of concern was approaching the north side of town. 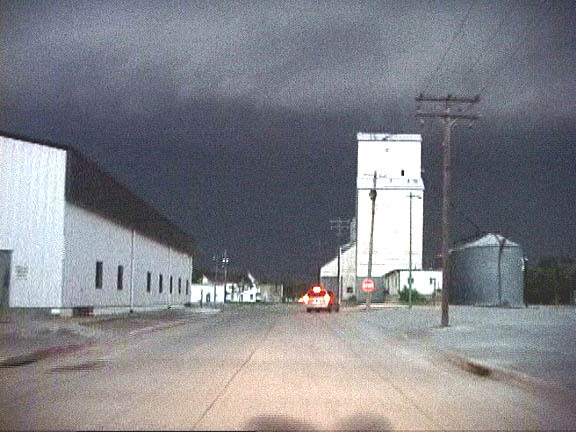 I blasted south and after several miles, I stopped to watch the storm cross over the town (15V) at 11:05PM. 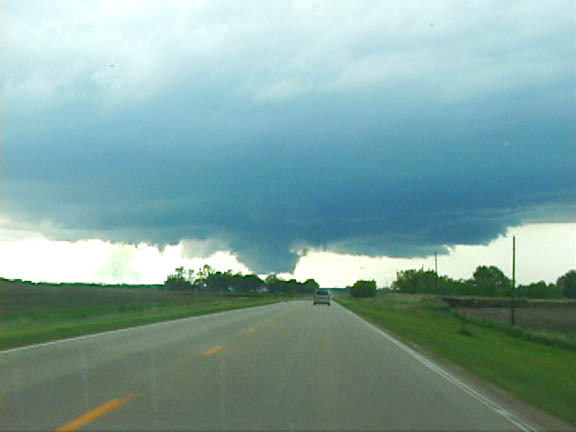 There appeared to be some rotation but I think the storm was more of a gustfront. It was very late when I finally was able to go to sleep. 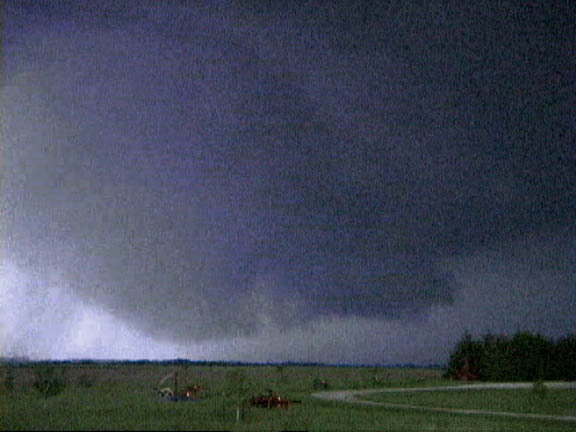 Hallam storm images are video stills. 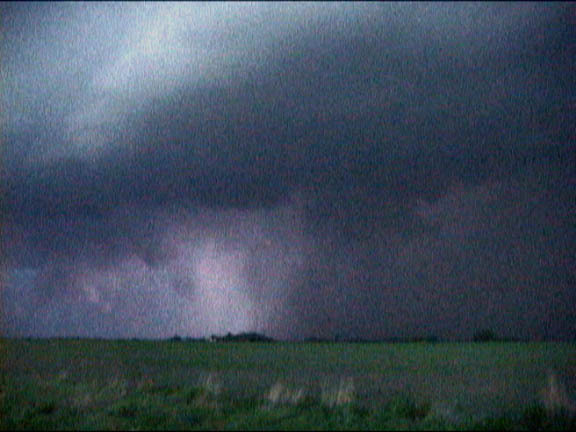 Although dark, the storm is easily visible on the video. I had some difficulty converting to stills for the website using Adobe Photoshop. 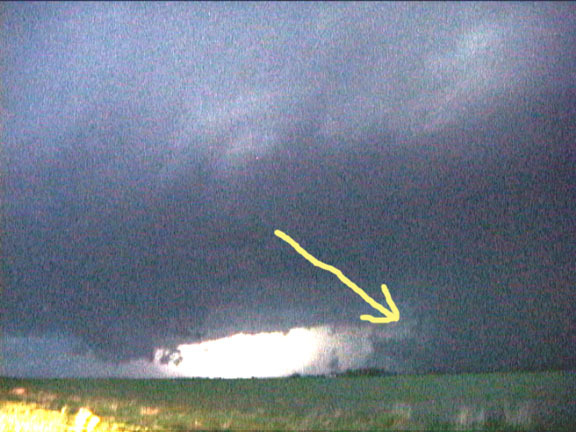 Enhanced video still of the massive wedge when it was near Wilber, NE. 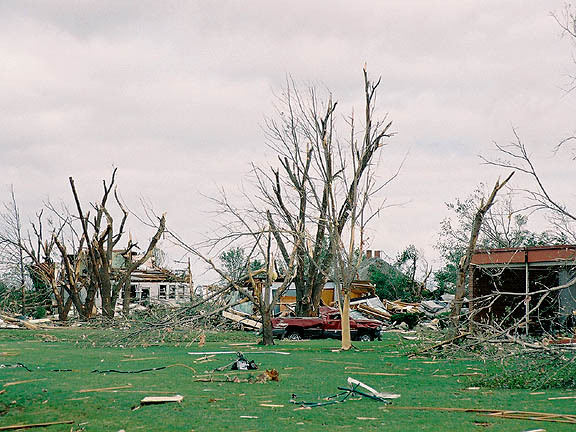 After checking news and other reports, I discovered that the town of Hallam, Nebraska was almost completely destroyed by a tornado. 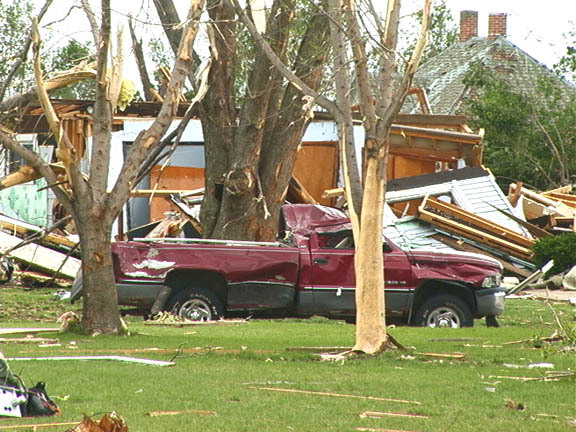 There was damage to surrounding towns including Wilber. There was one death. After breakfast, I met with Jeff at his hotel and we drove to the Hallam damage path. 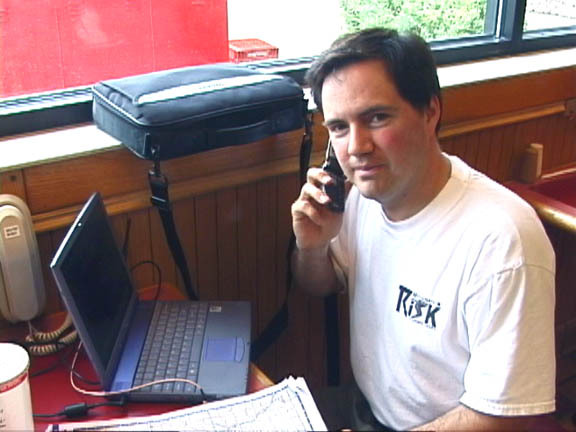 Jeff had to upload some video via one of the many satellite trucks. 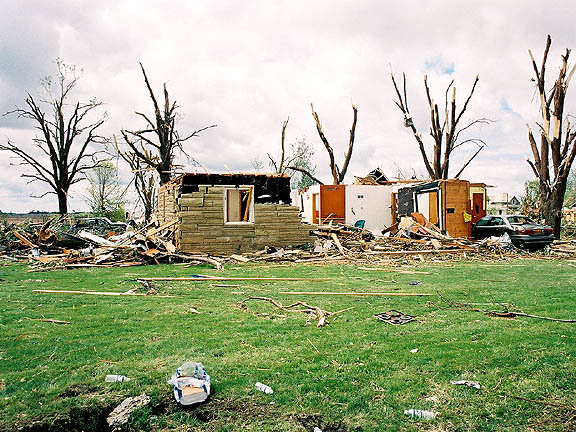 The sight of the town was horrifying with collapsed buildings and houses. 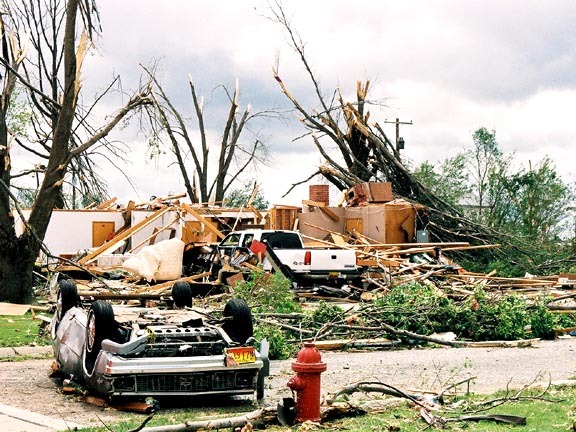 There were shredded trees and crumpled cars. A freight train was derailed. Propane and ammonia spewed out of damaged tanks. 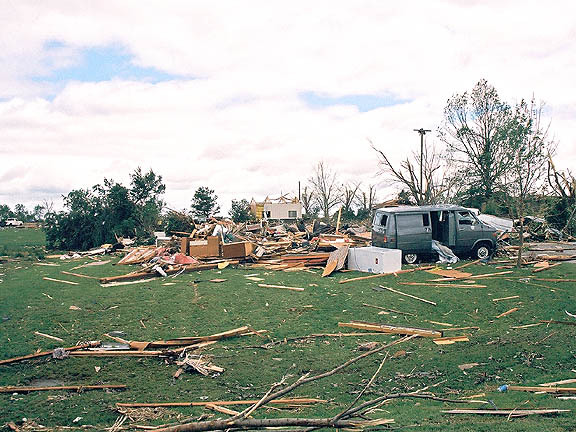 The National Guard patrolled the area. 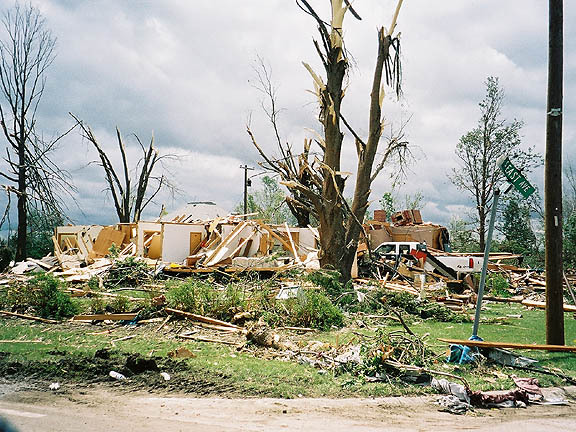 I accompanied some escorted reporters into part of the damage path where I took the pictures shown below along with some video. 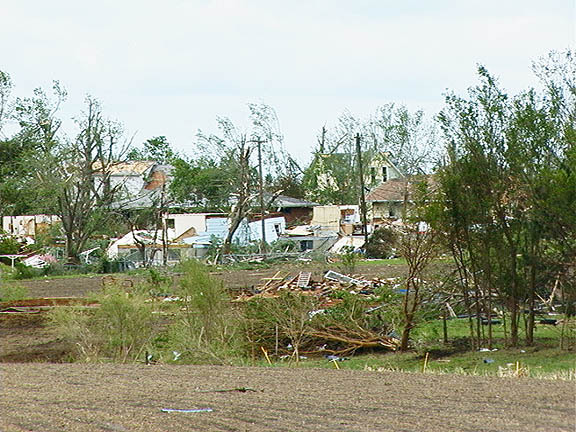 Saddened by the devastation, I soon left the area. Jeff stayed to shoot some additional video for The Weather Channel. 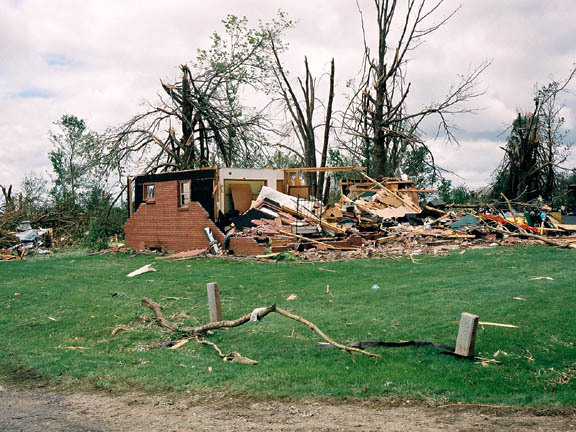 I later learned that the tornado hit the town of Hallam at 8:35PM. 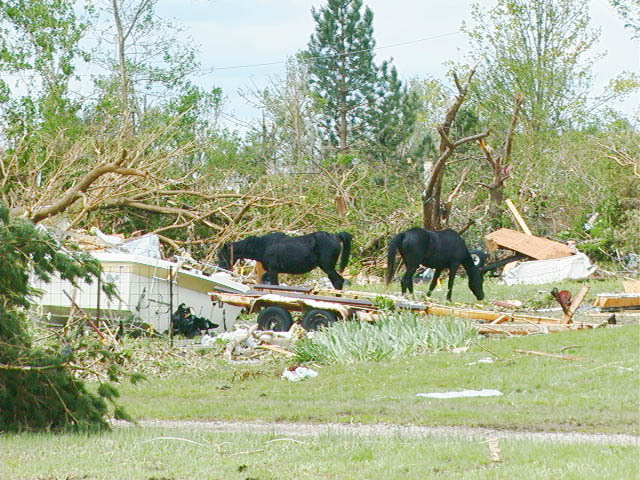 Other surrounding towns including Wilber were damaged. 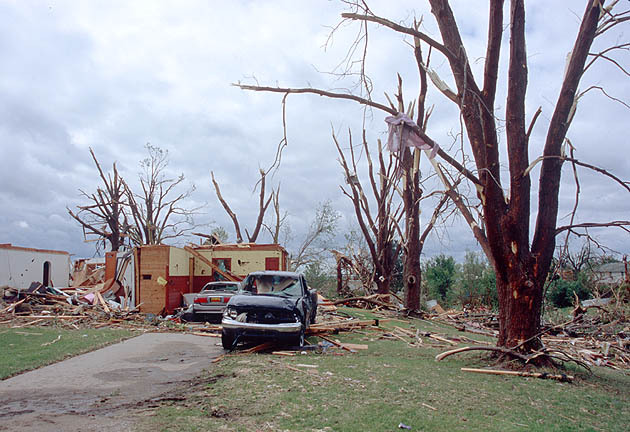 The tornado was rated a F4 on the Fujita damage scale. 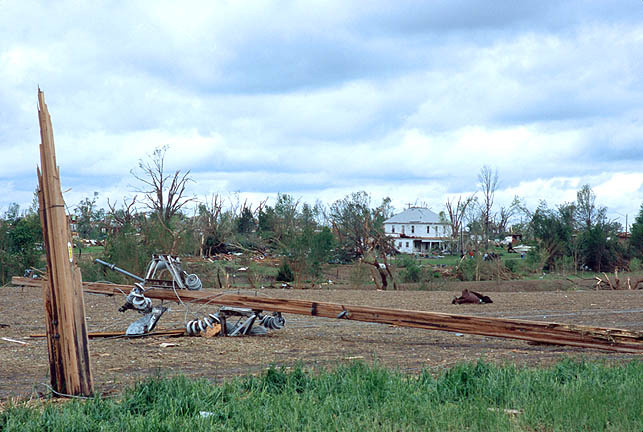 The damage path was a record TWO AND A HALF MILES in diameter. 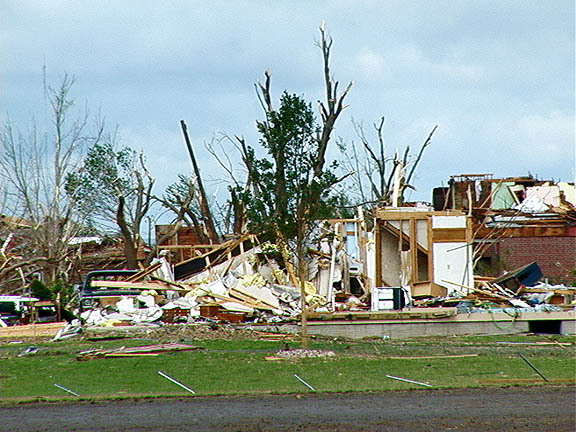 That was a very wide tornado.